Politically Punch drunk, Investment markets and Structured Product information (as requested by a number of clients). At home, it seems we’re a little punch drunk in relation to the politics of the vote to leave and what it means. The Times headline today, New Brexit referendum “is only way to end deadlock”. The country is clearly split on the Brexit issue, where there is now a more vocalized view of MP’s in relation to having a “2nd peoples’ vote” on the detail of issue. The complexity of matter is likely to dominate the headlines until a break through unravels……… President Trump cautioned the PM in relation to the chances of securing a trade deal would be jeopardized if the current plan goes ahead, which placed a further spanner in the works………. Sterling is likely to remain volatile and subject to news flow, with corporate investment and job security an issue, whilst the politicising continues. Investment markets have outperformed expectations to date but 2018 has seen an upswing in the “ups and downs” of the investment markets, mainly created by Trade issues, but the general picture of the Geo-Political position is creating an impact to the economy and Financial markets. Trump stated that the 3rd leg of his trip is likely to be easier – a meeting with Mr Putin, lets hope that the symbolic summit is good for the world. The eyes of the world are watching, so the news of how the meeting went will be broadcast shortly. European Commissions lowered its economic growth forecast for the Eurozone, chiefly as a result of rising US trade tension. It now estimates that the 19 Nations block will see GDP expand by 2.1% in 2018, down from its last prediction in May of 2.3%. Following the emails and blogs that we have been communicating, a number of clients have asked if we can further expand on “What is a Structured Product?”. We are shortly going to present our first newsletter in relation to Structured Products specifically – highlighting a number of product solutions, along with quality information and commentary. So, to answer the question in relation to “What is a Structured Product?” is enclosed. We have endeavored to make the summary as simple as possible – we are asking a provider to build a video blog which we can use on our site for those who prefer video content. A structured product is a market linked investment, with clearly defined return and risk outcomes. There are a range of differing structures; from defensive growth, to income, plans that have early return on capital features, more moderate and aggressive growth options. Ultimately there are structures that are likely to appeal to most people’s financial objectives. Structures are typically issued by large banks. It is important to understand the strength of each bank issuer and their financial strength, which is addressed further below. Most structures are linked to the performance of large global indices like the FTSE 100, the largest 100 companies listed on the London Stock Exchange. One of the most popular structures is a defensive auto call, of which we have outlined an example below. Why do banks issue them? Two reasons. To raise funding for the bank and the potential profit derived from trading and hedging. No, there is a risk that the index will rise by more than 8% per annum and your return is capped at 8% per annum (non-compounded). So, there is a chance this structure will underperform the index. In addition, you are forgoing any dividend paid on the index or interest. Capital is also at risk. If the structure never redeemed early and the index finishes below 60% of its initial level, then capital will be eroded on a one-for-one basis. 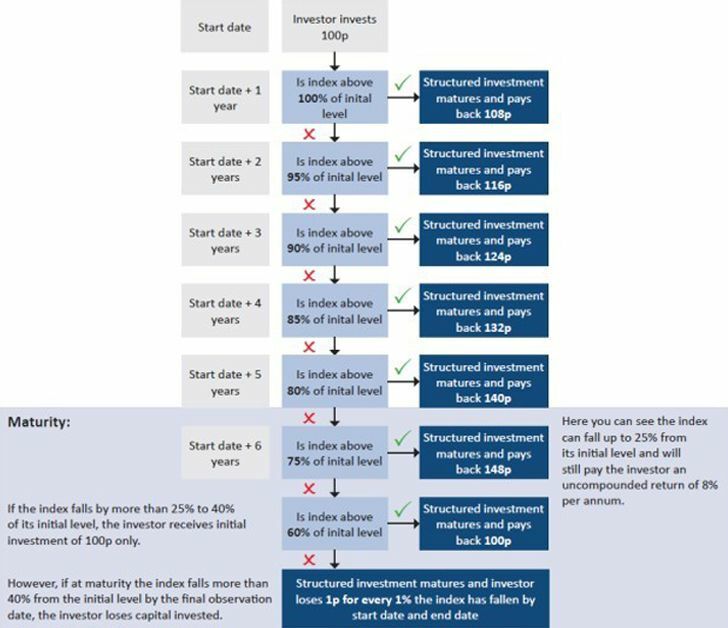 You are taking less risk on the downside than you would be through owning the index outright because there is protection down to 60% of the index level, but your capital is at risk nonetheless if equity markets fall below this level at maturity. Simply put, compared with owning the index, this structure gives away any potential upside above 8% per annum in return for a degree of capital protection and a high probability of receiving that 8% return. Like the majority of investments this is a very real risk, as explained above. Do you believe the bank will be capable of paying you back when the returns become due? The risk you have against the bank is the same as you would have through owning Senior Corporate bonds, as owners of this structure will be ranked alongside senior, unsecured and unsubordinated corporate bond holders in the queue of creditors. Bank defaults have been rare and global banks have repaired balance sheets since the Great Financial Crisis, adding significant capital to protect bondholders and depositors. Furthermore, we believe it’s also important to distinguish between stronger and weaker counterparties. Many of the stronger banks today, are identified as ‘Globally Systemic Banks’ (G-SIBs) who are considered systemically important to the global financial system e.g. JP Morgan, Citigroup in the U.S, Credit Suisse, UBS in Switzerland and HSBC and Barclays in the U.K. There are 30 in total and they are considered the biggest, with more stringent rules when it comes their corresponding levels of additional capital they are required to hold. 3. Other risks: Time horizon, inflation risk, exit risk, tax risk, however the two risks above probably more prominent. As always, it is most important for all investors to diverse investment holdings, making sure that they are not concentrated in one area, via sector, product or fund. If you have any questions or require advice in relation to any financial matte, simply get in touch.